Welcome to Home of UNESCO World Heritage Site Mt. Fuji! ※English-speaking guides are available at the 5th Station during the official climbing season. 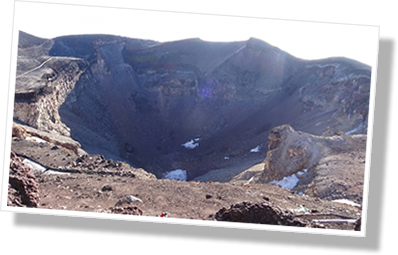 Until the late 19th century it was believed that peaks around the volcanic crater of Mt. Fuji resembled mandala, the Buddhist universe. Therefore there once were Buddhist buildings and statutes such as Vairocana (Dainichi) dedicated at the summit and people circled the crater that looks like a bowl (hachi) as their pilgrimages. This traditionally religious trekking course is still popular. Fujinomiya has developed around the Sengen Grand Shrine. The shrine is the headquarters of the Sengen shrines around Japan worshipping Mt. Fuji as the deity named Princess of Blossoms (Konohana-sakuya-hime). On the shrine’s ground 500 cherry trees are dedicated to her. She is the symbol of beauty and piety thus the guardian of happy home and easy childbirth. Because the town is well-watered thanks to runoff from Mt. Fuji, people come here to pray also for water, safety while traveling, fishing and good harvest, and against fires. The current pavilions were built under the patronage of Tokugawa Ieyasu, the father of the Edo shogunate government, in 1604. Ieyasu’s donation enabled the Sengen Grand Shrine to manage the summit area of Mt. Fuji above the 8th station as part of its precincts. Wakutama-ike, which literally means Pond of Rising Bubbles, is one of the notable structures in the main precincts of the Sengen Grand Shrine. It is a spring of the rainwater and the melted snow of Mt. Fuji that travel through the aquifer made of layers of volcanic rock before bubbling up from the ground. Hence the pond is the end of the ancient lava flow. This large quantity of water flows into Kanda River running through Fujinomiya City. The pond is designated as a special natural monument (tokubetsu tennen kinen-butsu). Here you can enjoy pastoral environments such as green prairies with cows. It is also a great spot for sports such as paragliding, hiking and golfing. The Tokai Nature Trail (Tokai Shizen Hodo) is a long walkway of 1,697 kilometers (1,054 miles) from Tokyo to Osaka. In Fujinomiya you can start from Wari-ishi Toge Pass and stop at Lake Tanuki-ko. Shiraito Falls is one of Japan’s top 100 waterfalls. Spring water of Mt. Fuji falls as thin streams that resemble white threads (shiraito) across the 150-meter-wide and 20-meter-high cascade. There are short walking trails down to the base of the waterfall where visitors can enjoy cool and refreshing mist. Lake Tanuki-ko is in the Fuji-Hakone-Izu National Park and is home to one of the greatest views of Mt. Fuji. A phenomenon called Diamond Fuji can be seen when the sun sparkles above Mt. Fuji during the sunrise and the mountain is reflected on the lake. The chance to catch the rare view usually comes both around April 20 and around August 20 for about a week. 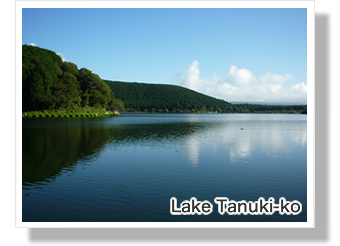 Lake Tanuki-ko is also great for camping especially in spring and fall. Nikko, Nichiren’s chief disciple, established temples at the foot of Mt. Fuji to fulfill his master’s command. Taiseki-ji Temple was built in 1290 and then Kitayama Honmon-ji Temple in 1298.